Well, one of the wonderful ladies that I used to work with is gaining a sister and wanted an extra-special cake for her shower...and that's when my inbox gave a ding...she sent me a photo of the wedding invitation...it is beautiful. Don't they look sweet? The top tier was lemon cake with lemon buttercream (the bride to be doesn't like chocolate...imagine that!) The bottom tier was Black Chocolate with Cream Icing. I have received reports of serious yumminess! Heather thank you !! The cake was a hit, it was delicious, it was beautiful and everyone RAVED about it !!! Jocelyn absolutely loved the choice, and adored the shoe :) Thanks so much again...... you rock ! Thank you! It was a delight to make! ...and you should too! A young woman I know sure does...and she didn't want her love to weight another year to celebrate his birthday. So, she called their friends, invited them over and then she called me...the neighbourhood 'cake lady'. We looked at a number of cakes but none of them were just right...so then she went on my description...she said 'do it'. So I created a workout bench and weights for her weight lifting boyfriend. Everything is edible except the silver bar, it is a cake support. The bench is Black Forest Cake with Sweet Dark Cherry Filling and the dumbbells are yellow cake with chocolate filling. Yum! Hope you had a great day Steve! Loads of Treats for our Tricksters! I had the pleasure of spending my afternoon with 4 fun kids (2 of my own) and creating some fun Halloween treats! The main event was the 'Boo' Blocks but we had to let the paint dry so we filled that time with some other goulish goodies! What Mummy doesn't LOVE chocolate? This is a mini-chocolate bar wrapped in first aide tape! Frankly, I am a real sucker for Halloween...what about you? 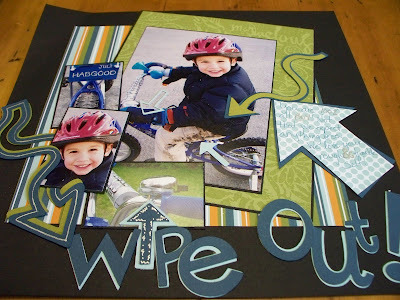 Finally the sweet finale was this card using Stampin' Up! 's latest Holiday stamp set along with the coordinating punch and goodie cup! Stayed tuned for more ghoulish surprises coming your way! 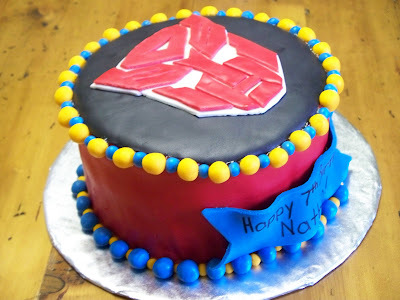 I was recently contacted by a woman (it's hard not to call her a girl) who I went to grade school with to make a cake for her son's 7th birthday. 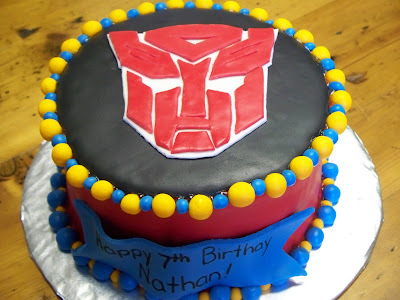 He is having a Transformers Party today...I can't believe all the toys we played with and the shows we watched are all back en vogue with the kids today! Everything from Transformers and Star Wars to Strawberry Shortcake...incredible!!! Nathan and his friends will be enjoying a vanilla cake with chocolate frosting...yum! My DH happened to have a dentist appointment near their house this morning so he was kind enough to deliver it (we don't usually deliver outside of Beamsville). When he got there he opened it to ensure that everything was okay (isn't he great?) and my friend said "Wow, I can smell the sugar". Yes, dear readers...there is some sugar in this cake! 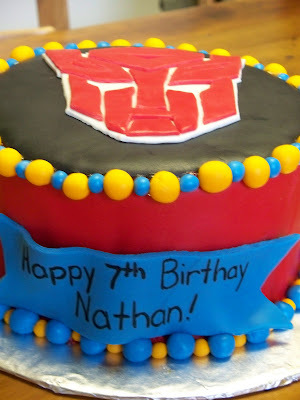 Well, Happy 7th Birthday Nathan! I feel confident that the Autobots will once again defeat the Decepticons especially with you leading the troops! Well, I had all the photos printed to do a sister page and just never got around to it (I also was having a tough time with paper...) Well, while tidying my workshop I found the photos and started work right there and then! I found paper...yeah! It's a new one from SU! so if you love it, you can still get it! So, here she is...our Purplicious Daughter! 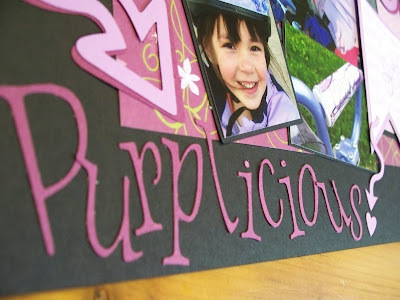 Or our Purple Princess...the title was a tough one to settle on! I know I already shared these cupcakes with you but not only were they fun for the kids to decorate, they were fun to eat too! Simon says...they are finger lickin' good! Sean wouldn't pause a minute for a photo! Sarah, of course, took the time to pose... Oh no! Who ate the last cupcake??? Fun was had by all and the yum factor was high! Growing up we celebrated Thanksgiving when I was young but as we got older my mother kind of gave up on the traditions. The honest truth is I don't really like turkey and well, I didn't back then either. It meant a lot of work, a lot of dishes and a lot of food...not a lot of fun in my mind...but I never have been much of a traditionalist! I used to go to my best friend's house for Thanksgiving. Her mom did it up right...and boy was it ever crazy! The stress! It was fun only because I was with my friend and truth be told the food was delish! So, now I find myself with a family of my own not cooking turkey...the one white meat that I just don't really eat! But if you have some bones, I would love to make up some turkey soup! Yum!!! Turkey cupcakes that is...as if they're aren't enough turkeys in this house!!! 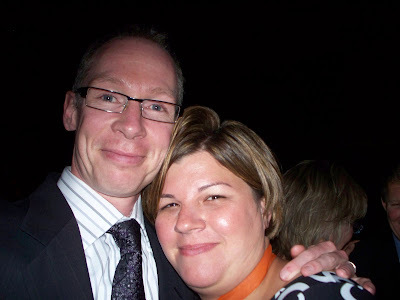 Now, in taking my photos I noticed a rather suspect blur in the photos...sorry about that...little hands you know! So here are my friends not so blurry now...the kids loved being involved in the creation of these. 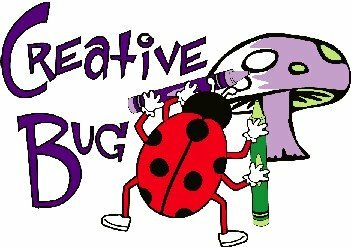 I told them that today we would have Creative Habgoods...so there you have it! PS We don't have a big meal on Christmas either!!! We have a brunch and enjoy some company at the house. ps at least I cannot claim boredom over here...Sarah is crying over a breakfast error...not that she has eaten a bite yet but she would rather cry and go hungry then eat what was presented (in error or not). The jeans I can explain, the shoes… I can not. You may want to ask Simon why he thought Daddy’s shoes required laundering. He has a penchant for placing things in containers. Even though Sarah only has one side of the bed in which to get out on… I think we should move her bed! Hope things improve over there. Our conversation has been continuing along these lines all morning while I try to convince his colleague that cookies ought to be enough to surrender Martin on the upcoming PD Day (end of payperiod in their world...he will be working late). So here we are...I consider us newly weds yet. Maybe that will change after 10 or 20 years. Who knows? I certain don't! And the delightful curtains that I have been slaving away on!!! I used the tutorial from Lil Blue Boo to hang them. I didn't use wired ribbon because I got a super deal on this ribbon...so my bows are a little sideways. What can I say? I love them anyway! In case you are wondering, we found the dresser and headboard/footboard from a warehouse and painted them and fixed them up...what a steal!